Shimla is the largest city of the northern Indian state of Himachal Pradesh. It is the capital city of Himachal Pradesh. This city is a hub of India’s tourism sector. Shimla, the “Queen of Himalayas” is a heart of a quality education. It is a home of a large number of colleges & universities which offer education in the area of engineering & technology. As per the recorded census 2011, the average literacy rate of Himachal Pradesh state is 83.64%. 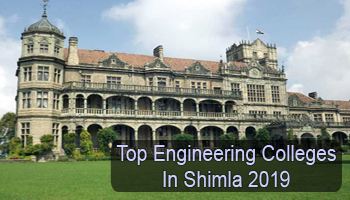 Candidates check this article to get detailed information about Top Engineering Colleges in Shimla 2019. At sarvgyan.com, we have listed a list of top engineering colleges in Shimla for session 2019-2020. The list is comprised of all the reputed government & private universities/institutions. All the listed colleges offer 4 years Bachelor of Technology (B.Tech) programme. After a deep study & research, we have listed these colleges on the basis of several factors. These factors are quality education, academic excellence, national importance, college affiliation & approval, student’s preferences, placement statistics, college infrastructure & facilities, faculty ratio, etc. For admission to the engineering course, students will have to appear in the national level engineering exam known as JEE Main. Through this exam, students will get admission to the B.Tech & B.Arch courses. Some Universities will also organize its own entrance test to provide admission into these programmes. For admission to the PG engineering course, i.e. M.Tech, students have to qualify the GATE examination. Various institutions/universities in Shimla offers engineering courses in different disciplines. The most sought disciplines/specializations are Aeronautical Engineering, Electronics & Communication Engineering, Civil Engineering, Electrical Engineering, Computer Science & Engineering, Mechanical Engineering, Industrial Production, etc. If you have any other queries about Top Engineering Colleges in Shimla 2019, you can leave your query in the comment box given below.